Every year, I do this. And, since 2015 is a year, I'll do it this year. And today is the day. You know what today is, right? Now, I know, George Washington's birthday is actually February 22nd. That's not until Sunday. But, there is a federal holiday called Washington's Birthday, and it's to honor George Washington. And the name of that holiday is ... Washington's Birthday. So, why does everybody call it Presidents Day? Well, not everybody does. I don't. And, I hope, you don't either. But there are a lot of folks running around loose that call it Presidents Day. But that doesn't make it Presidents Day. It's still Washington's Birthday. 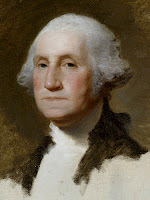 Washington's Birthday was the fifth national holiday established, after New Year's Day, Independence Day, Thanksgiving Day, and Christmas Day. It was one of the holidays picked for a Monday observance in 1971 when they started screwing around with federal holidays, and making some fall on a Monday. Along with Washington's Birthday, the holidays Memorial Day, Labor Day, and Columbus Day were also moved to Mondays. The first four holidays and Veterans Day kept their regular days. If you want one of "those people" that are always correcting others for things ... you know, like I'm doing right now ... and you want a link to throw at people, use this link to United States Code 5 U.S.C. 6103. George Washington has his own day. And Americans need to recognize that. It's not often the government gets stuff right. This is one of those rare times. Don't let regular folks screw that up. Bravo, Basil! George Washington was a truly great man. He refused to be king (some folks actually wanted him to be king). He refused to run for a third term as President, which he would almost certainly have won, thus setting a precedent that stood until 1940, and has not been formalized by constitutional amendment. Only a truly great man could have resisted the allure of power like that. When I was a small lad in elementary school I vaguely remember getting Washington’s Birthday and Lincoln’s Birthday off from school. So we had two holidays in February. This was the early days of Reagan (also a February Birthday and should be a holiday In My Arrogant Opinion) so my memory may be a bit fuzzy on getting Lincoln’s Birthday off as I was more concerned with learning how to fight the Ruskies. It was the Cold War after all. They should separate the Birthdays out and make them holidays. Every Monday in February should be a holiday. It is a wasted month anyway. It is only there to make up for accounting errors in the way we measure time and solar cycles and have a place to stick Black History Month. The only other bright spot in the month is my wife and I anniversary, but I mainly worked that one out as a ploy to get out of Valentine’s day by just combining the two days since they are so close together. I remember them being 2 separate holidays too, I also remember being annoyed when they combined them. The teachers union would never stand for that now. Don't go telling Obama voters that February/black 'history' month is the shortest month, it'll give them another reason to call us racists. Also, could someone remind me when white history month is, I keep forgetting. Keep in mind that only some states combined the holidays to make a state holiday. At the federal level, it's still a single national holiday for George Washington. I am apparently slightly older than you Awesome. I clearly remember Lincoln's birthday, a week before GW's. In NY it was a state holiday. And when you're in jr high (20 years before "middle school") Every holiday is important. And yes, today's teachers unions would never stand for losing a paid day off. I started 1st grade in 1978. I have a late in the year birthday and the school told my mom to have me skip Kindergarden as I would have been bored with it. Yes it was back in the time when the school would allow you to miss a year of indoctrination and there was no such thing as K3 and K4. Florida had both as holidays for that month with Washington being the Federal holiday. No way that the Union would let them get away with that today. It was a simpler time. Didn't Black History Month used to be January 15 - February 15, so they could loop in MLK Jr.'s birthday? I missed this post yesterday because I was off for Washington's birthday. But I look forward to this post every year and often share it with others.